I challenged to cook a new Szechuan dish item for my dinner. According to my dictionary, its name is "twice cooked pork." It's one of the popular Chinese menu item in Japan and I like it next to Mabo Tofu. I found the reason for the item's name when I looked into a recipe on the Internet. Pork should be boiled with ginger and then fried with cabbage. 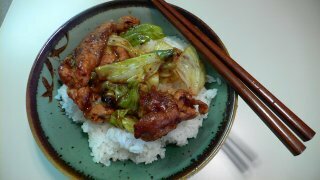 Unfortunately, I made two mistakes on this cooking, and my first "twice cooked pork" was not delicious; it wasn't tasty and a little bit bitter, because I scorched the cabbage and I used salad oil instead of oyster sauce.